GIMP has great flexibility for arranging dialog windows on your screen. Instead of placing each dialog in its own window, you can group dialogs using docks. A "dock" is a container window that can hold a collection of persistent dialogs, such as the Tool Options dialog, Brushes dialog, Palette dialog, etc. Docks cannot, however, hold non-persistent dialogs such as the Preferences dialog or an Image window. The Layers, Channels and Paths dock. The Brushes, Patterns and Gradients dock. In these docks, each window is in its own tab. The Toolbox is a utility window. The Tool Options window is normally attached under the Toolbox and displays the options of the selected tool. Use Windows → Dockable Dialogs. view a list of dockable dialogs. Choose a dockable dialog from the list to view the dialog. If the dialog is available in a dock, then it is made visible. If the dialog is not in a dock, then it is displayed in its own window. Note that the Windows command is only available while an image is open for editing. Every dockable dialog has two types of docking areas: the docking bars and the docking-tab area. In a dock, the docking-tab area covers the entire window. The dockable window is docked onto a dock bar. The dockable window is docked onto the docking-tab area. A new tab has been created. Each dockable window has two docking bars. These bars are thin gray bars, very unobtrusive and easy to not notice: most people don't realize that they exist until they are specifically pointed out. A window with docking bars highlighted. or into the docking-tab area so that the dialog is added as a tab. This screenshot shows the area that can be used to drag a dialog window onto a dock. It can also be used to take a dialog off the dock. You can drag more than one dialog onto the same docking bar. If you do, the dialogs are displayed as tabs, represented by iconic symbols at the top. Click on the iconic symbol to bring the tab to the front. 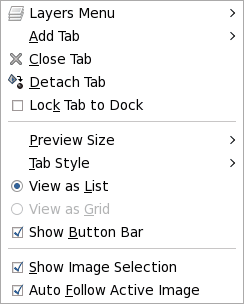 You can also add, detach, or delete a tab window using the Tab menu (see below). Press TAB in an Image window to toggle the visibility of the docks. This is useful if the docks hide a portion of the image Window. You can quickly hide all the docks, do your work, then display all the docs again. Pressing TAB inside a dock to navigate through the dock. Some docks contain an Image Selection Menu: a menu listing all of the images open in GIMP. The Image Menu displays the name of the image whose information is shown in the dock. Use the Auto button to toggle the value of Auto Follow Active Image. Suppose you are using the Layers dialog and you want to see the layers for a different image. Select the desired image from the Image Selection Menu. Although this is convenient, do not forget that you changed the working image for the dock. Setting Auto Follow Active Image from the Tab menu helps to avoid this problem. Figure 3.8. A dock with an Image Menu highlighted. Figure 3.9. A dialog in a dock, with the Tab menu button highlighted. In each dialog, you can access a special menu of tab-related operations by pressing the Tab Menu button, as highlighted in the figure above. Exactly which commands are shown in the menu varies a bit from dialog to dialog, but they always include operations for creating new tabs, or closing or detaching tabs. Figure 3.10. Tab menu from the Layers dialog. At the top of each Tab menu is an entry that opens into the dialog's context menu, which contains operations specific to that particular type of dialog. 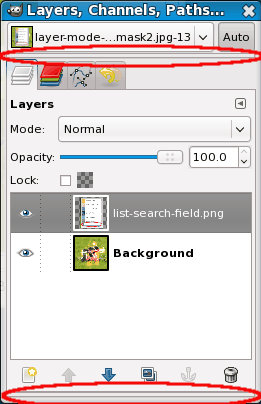 For example, the context menu for the Layers tab is Layers Menu, which contains a set of operations for manipulating layers. Add Tab opens into a submenu allowing you to add a large variety of dockable dialogs as new tabs. Close the dialog. Closing the last dialog in a dock causes the dock itself to close. Detach the dialog from the dock, creating a new dock with the detached dialog as its only member. It has the same effect as dragging the tab out of the dock and releasing it at a location where it cannot be docked. If the tab is locked, this menu item is insensitive and grayed out. Prevent the dialog from being moved or detached. When activated, Detach Tab is insensitive and grayed out. Figure 3.12. Preview Size submenu of a Tab menu. Many, but not all, dialogs have Tab menus containing a Preview Size option, which opens into a submenu giving a list of sizes for the items in the dialog (see the figure above). For example, the Brushes dialog shows pictures of all available brushes: the Preview Size determines how large the pictures are. The default is Medium. Figure 3.13. Tab Style submenu of a Tab menu. Use an icon to represent the dialog type. Is only available for dialogs that allows you to select something, such as a brush, pattern, gradient, etc. Current Status shows a representation of the currently selected item in the tab top. Use text to display the dialog type. Using both an icon and text results in wider tabs. Show the currently selected item and text with the dialog type. 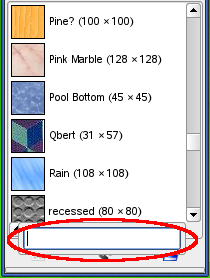 These entries are shown in dialogs that allow you to select an item from a set: brushes, patterns, fonts, etc. You can choose to view the items as a vertical list, with the name of each beside it, or as a grid, with representations of the items but no names. Each has its advantages: viewing as a list gives you more information, but viewing as a grid allows you to see more possibilities at once. The default for this varies across dialogs: for brushes and patterns, the default is a grid; for most other things, the default is a list. When the treeview is View as List, pressing Ctrl+F (or Ctrl+S, it depends on your GTK+ keybindings), opens a text box, a search field, where you can enter the first letter(s) of the name of the item you want. The search field will not open with View as Grid. Figure 3.14. The list search field. Use Ctrl+F to open the list search field. The list search field automatically closes after five seconds if you do nothing. The search field shortcut is also available for the treeview you get in the “Brush”, “Font” or “Pattern” option of several tools. 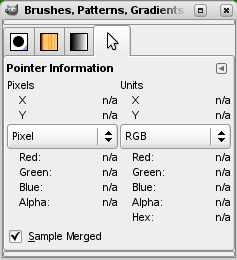 Some dialogs display a button bar on the bottom of the dialog; for example, the Patterns, Brushes, Gradients, and Images dialogs. This is a toggle. If it is checked, then the Button Bar is displayed. Figure 3.15. Button Bar on the Brushes dialog. This is a toggle. If it is checked, then an Image Menu is shown at the top of the dock (see Figure 3.8, “A dock with an Image Menu highlighted.”). It is not available for dialogs docked below the Toolbox. This option is interesting only if you have several open images on your screen. This option is also interesting only if you have several images open on your screen. Then, the information displayed in a dock is always that of the selected image in the Image Selection drop-down list. If the Auto Follow Active Image is disabled, the image can be selected only in the Image Selection. If enabled, you can also select it by activating the image directly (clicking on its title bar).